Madrid Sep 14 (IANS) Atletico Madrid coach Diego Simeone on Friday said that he is used to the pressure adding that results are always the key to change a difficult situation amid criticism that his team has underperformed so far in the new season. The 2013-2014 La Liga champions hold the tenth spot in the league table after a shaky start including a 2-0 defeat against Celta Vigo just before the international break reports Efe. "Beyond (the fact) that I may make mistakes ... 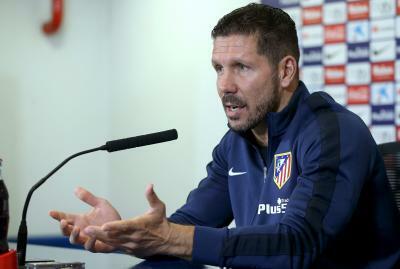 I hopefully make as few mistakes as possible while choosing the starting players " Simeone said in a press conference after the morning session on the eve of Saturday s La Liga clash against Eibar. Simeone has only 16 first-team players available for the game missing injured Nikola Kalinic Santiago Arias Victor Machin known as Vitolo and Stefan Savic. "We accepted the challenge and the difficulty that we could have with a small squad " Simeone said adding that the 20-man squad could have its benefits for the current season.